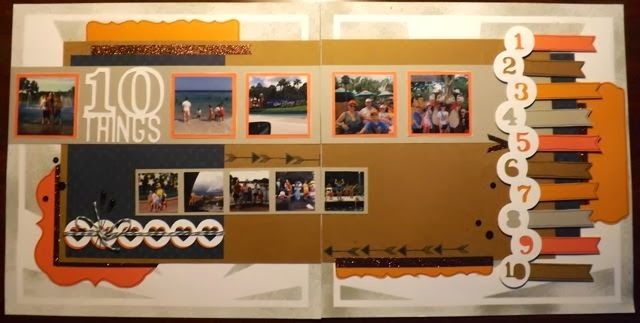 So my number one favorite thing about this layout is that our entire vacation this summer is summed up on this one page! I plan on putting this in my kids albums and then making a separate album for the whole vacation. The first thing we did for this page was use an overlay to put over the White Daisy paper and spritz it with Slate ink and water mixed in one of our spray pens. While that was drying assembled all the millions, ok not millions but lots of little pieces, like the hearts border and the background and Baker's Twine that went with it and the 10 things border on the right and the journaling spots that went with it as well as the colors under the numbers. There was also stamping with All the Details, Bronze Shimmer trim and Black mini medley! One of my favorite little touches on this was the outlining we did with journaling pens around the shapes and journaling spots. It seemed so trivial at the time and I wasn't going to do it but I noticed it really added a lot. Sometimes those little things are what make it special! Oh, and I bet you can't guess which cartridge was used to cut most of special touches and shapes on this layout! I also entered this in the 4 Crafty Chicks Challenge - Anything but a Card! Thanks for playing our challenge this week, awesome job!